Texas A&M University Press, 9781585442614, 248pp. 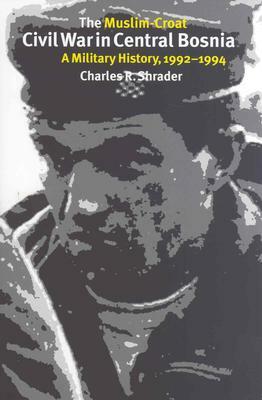 In The Muslim-Croat Civil War in Central Bosnia, 1992–1994 Charles R. Shrader offers the first full-scale military history of a crucial conflict in Bosnia between two former allies. When the Bosnian Serbs and their Serbian allies attacked Bosnia-Herzegovina in March, 1992, the Bosnian Croats and Muslims collaborated to defend themselves. As Serbian pressure increased and it became clear that the West would not intervene, the two allies began to stake out their own claims. Drawing on testimony and exhibits from cases presented before the International Criminal Tribunal for the former Yugoslavia, Shrader describes the organization and tactical doctrine of the Croatian Defense Forces and the Muslim-led Army of Bosnia-Herzegovina. He analyzes the strengths and weaknesses of the two sides in such fields as communications, training, and logistics. He assesses not only the problems of command and control in the newly formed armies, but also the impact of criminal activity, the mujahedeen, and the intervention of peacekeeping forces. What looked to many like aggression by the Bosnian Croats, Shrader views as the adoption of an “active defense,” a doctrine embraced by U. S. forces, against a predatory Muslim force. He believes UN and European observes rushed to judgment regarding the aggressive intent of the Croatian command. Far from being the attackers, Shrader concludes, the Bosnian Croats in Central Bosnia were clearly outnumbered, outgunned, and on the defensive. Surrounded by superior Muslim forces, they barely held out in their enclaves in the Lasva Valley until a cease-fire was achieved in February 1994. Although Shrader’s work is a detailed, meticulous, analysis by a neutral expert, not everyone will find his conclusions comfortable. But every serious student of the conflict in Bosnia will have to take his history into account. Enhanced by maps, useful appendices, and a glossary, this should become the standard work on military operations in Central Bosnia and a useful case study of internal warfare and ethnic conflict. Charles R. Shrader began research for this book while serving as a military consultant on a case before the war crimes tribunal at The Hague and continued his research with field studies of the battle sites. Until his retirement from the U. S. Army in 1987, he held a number of positions involving the study and teaching of military history and the analysis of warfare. With a Ph.D. from Columbia University, he has taught at West Point, the Command and General Staff College at Fort Leavenworth, and the Army War College. He also served at the U. S. Army Military History Institute at Carlisle Barracks and at the U. S. Army Center of Military History in Washington. He is the author of several books and articles on both military history and medieval history.